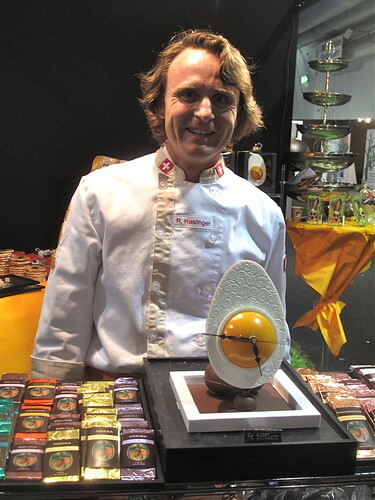 I’m still smiling from all the excitement of Switzerland’s first Salon du Chocolat (could also be the sugar). 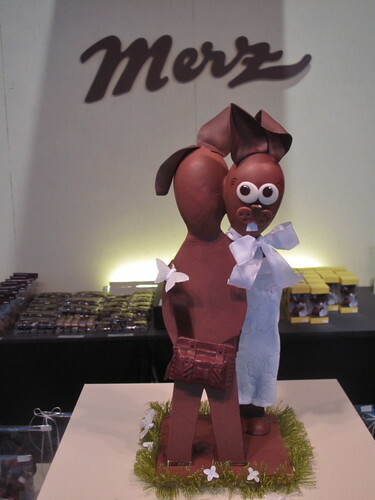 Well over 15,000 people visited this chocolate extravaganza in Zürich during the last weekend in March. They gazed with open mouths and cameras in hand at dresses made of real chocolate; they tasted exotic flavored ganaches and strawberries dipped in a chocolate fountain; they watched pastry chefs plate sophisticated desserts before their eyes – that ended up in their stomachs thereafter; they listened to experts explain the subtleties of pairing chocolate with wine, whisky or even just water; and they discovered chocolate companies from around the country that they may not have heard of before. For three days, it was a treat for all the senses. If you didn’t have a chance to taste Honold’s newest chocolate creation, Lotti’s Best, it’s worth a trip to their shop in Zürich for just that (flaky nougat, tonka bean and fleur de sel). 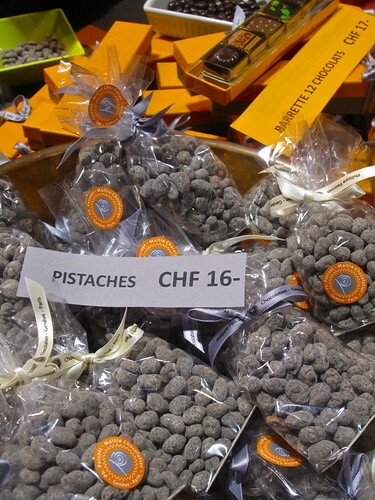 I’d also hop on a train to Geneva just for Philippe Pascoët’s caramelized pistachios dipped in dark chocolate. Addictively good. Nobile Cioccolato launched their new packaging at the show, along with a new milk chocolate bar made with roasted pistachios, strawberry, mango, Borneo pepper and fleur de sel. 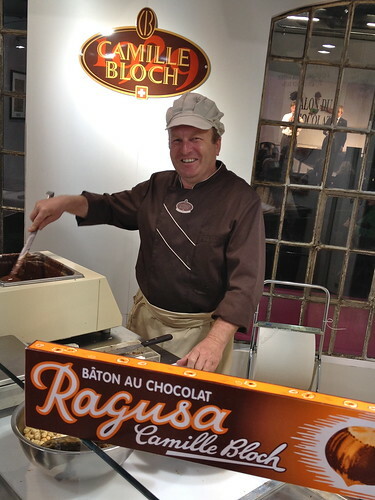 And below you’ll see the always smiling Fredy Vogt, chocolatier for Camille Bloch, who tempted us with freshly made batches of Ragusa, a Swiss classic. That vintage packaging in front of him isn’t just decoration; it’s an actual 750 gram bar ! If everyone wasn’t already in the Easter mode, there were plenty of holiday inspired creations to help. There was the making of some seriously divine and generous Easter baskets at the show (photos below). If you’re a Lego fan like me, Du Rhône Chocolatier had just the thing for you. 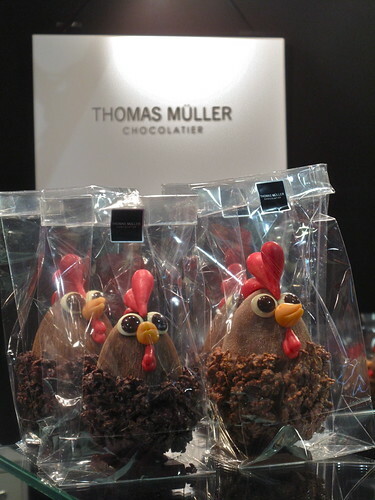 And how could Thomas Müller’s adorable chickens not put a smile on your face ?! 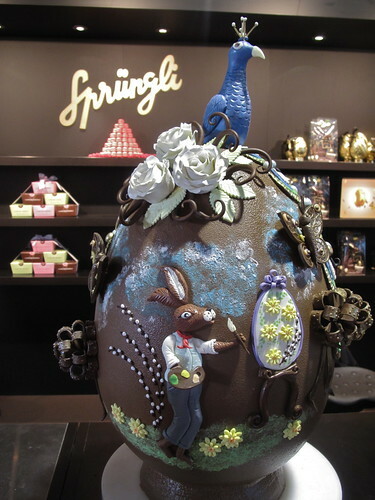 René Haslinger put a very Swiss touch on his Easter egg (it’s a clock), and all passersby were wowed by the chocolatiers at Sprüngli, who were decorating a beautiful oversized egg all weekend long. Below you’ll see a cannelé topped with a chocolate surprise, prepared by star chef Tobias Funke and pastry chef Yannick Mertzweiler; there’s Fabian Sänger and Nicole Beckmann having a bit of fun before their demo; Ladurée Pastry Chef Nicolas Haelewyn coating his chocolate macarons in gold; and a spectacular, original creation by Kay Baumgardt and Olivier Matthey of Hotel Bad Bubendorf, made with chocolate, rhubarb, lemon cress, strawberry and vanilla. 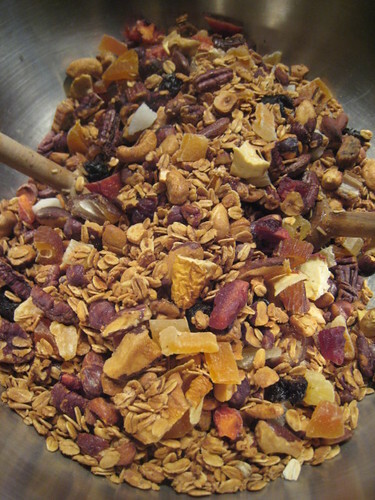 I’m also still thinking about the Widder Hotel’s “Moroccan Bomb,” a likewise beautiful and sublime dessert by Pastry Chef Abdeliah Lamkhizni, that had upwards of 30 ingredients, including olive oil, argan oil, candied hazelnuts, ras el hanout and several varieties of citrus. 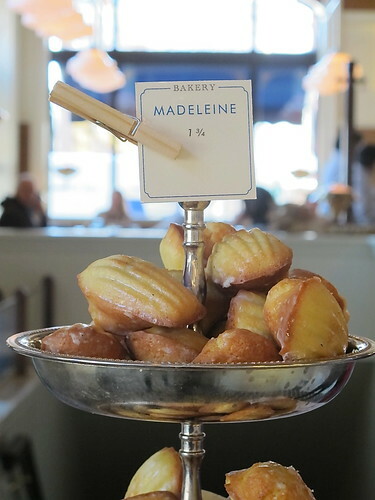 To those of you who visited this sweet Swiss Salon, what did you think ? 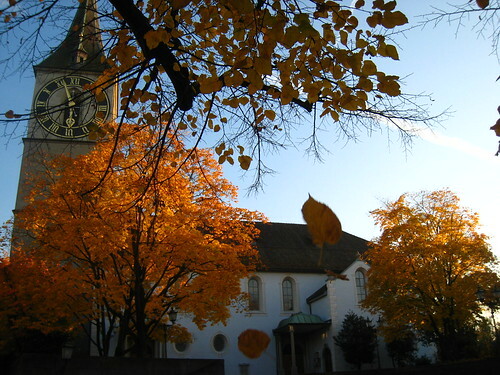 Any favorite tastes, demos, conferences, stands or activities ? 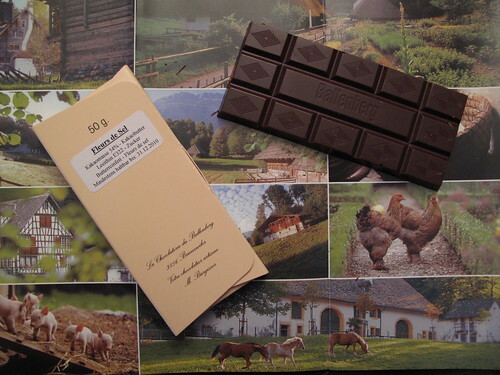 As soon as we finalize the date for Zürich’s 2nd annual Salon du Chocolat in 2013, I’ll be sure to let you know ! 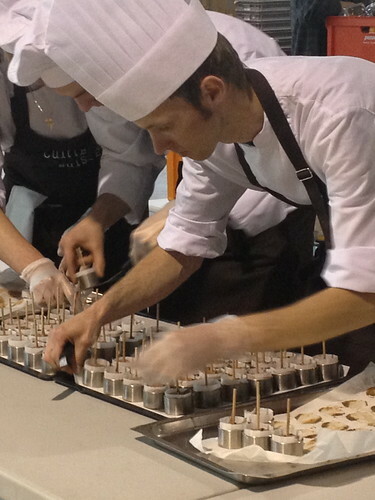 In the meantime, a whole new season of Salon du Chocolat begins in just 6 months in Paris, with its 18th show there, sure to be yet another sweet success ! 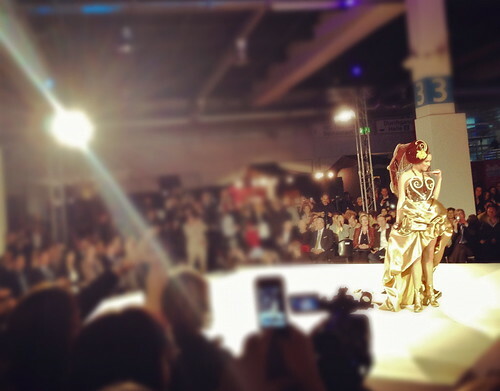 Bonus: watch the Fashion Show in its entirety and see all of the chocolatiers’ wild creations. Amazing what they can do with chocolate ! Looks like it turned out wonderfully! Lots of names, lots of eggs, lots of smiles:) I like the bunny couple, aww. 15,000 is a terrible high number of people. Wow! The pictures are amazing – beautiful creations. The cute baby outfit got my attention. I know of a mom-to-be who would love to have that for her kid. ;o) Better not show her the picture. The Sprungli egg Is amazing! So full of little details. What about those cute little birds right on top of that picture. Don’t want to call them chicken as I don’t think that;s what they are. They are dead cute though. 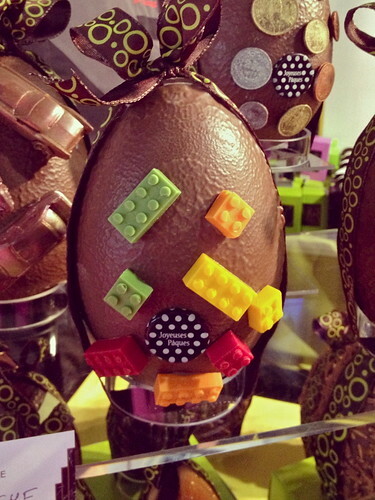 Lego pieces on that chocolate egg..would have been difficult to resist. Pascoet’s pistachios have gone to my list. Might have to put Geneva in a future city break list. The fashion show always amazes me – how do they get all those pieces done? Is there a very strong smell of chocolate in the air as the models move swiftly by? 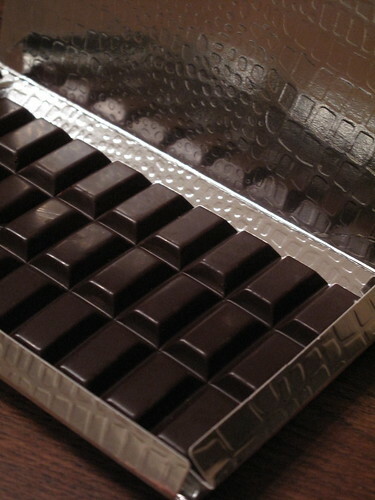 Oh, did they have a raffle for the Camille bloch huge bar? Thank you for sharing. It makes the likes of us who are far way, too feel a bit close to it. Emma, it most certainly did, thanks ! Wish you were there. 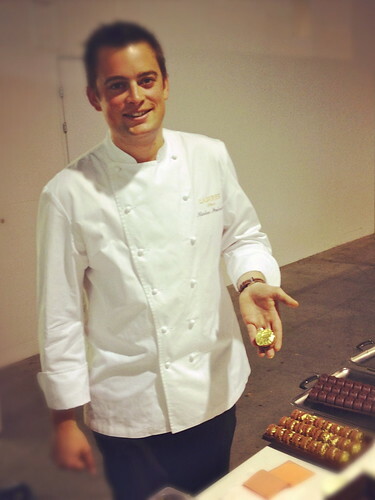 valentina, you would have been in heaven at the Salon du Chocolat. We’ll have to get you over here too next year. 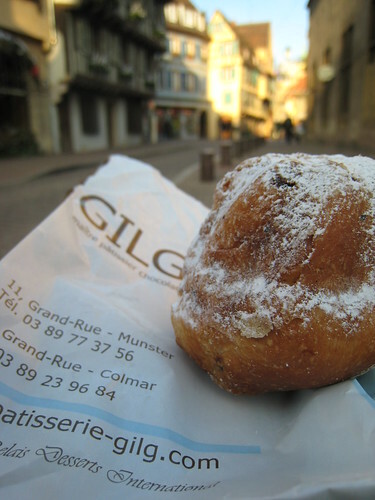 And if you’re heading to Geneva, I’ll have to meet YOU there for a Sweet Geneva tour, but of course ! 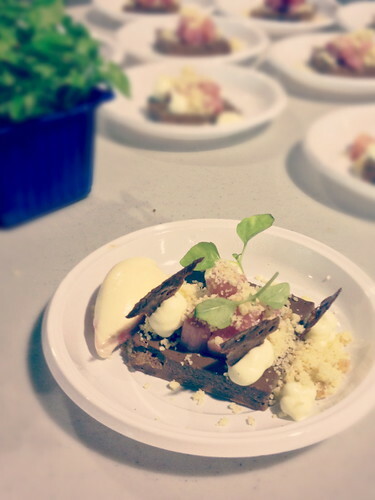 =) The entire event space smelled like chocolate all weekend long, it was a dream ! 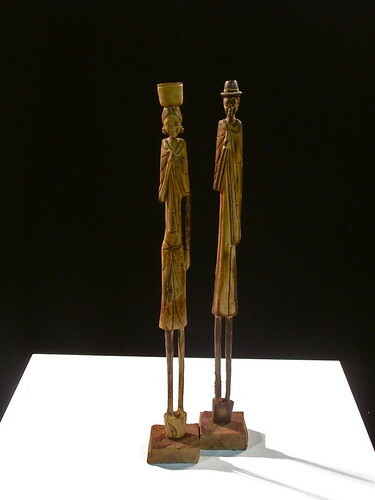 As for the Ragusa bar, it wasn’t on raffle – tons of people bought it. It was a special, in vintage packaging, what they used decades ago. So fun ! Amazing! The chickens are so cute and wouldn’t you love to have that egg on your Passover table and my Easter table. Wow! That looks like such an amazing event!! 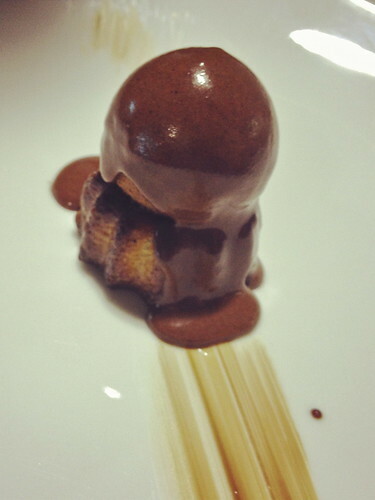 How exciting to see ans sample all of those great chocolate creations. I especially love those little chickens from Muller. You’re right, they’re adorable! 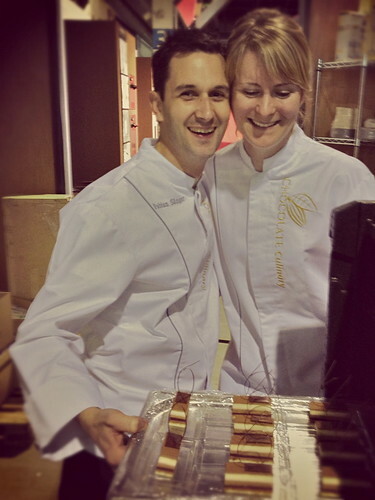 Congrats on a very successful 1st Salon du Chocolat in Zurich!!!! I do love the little chickens and the bride and groom. Everyone of your photos makes me gain weight! All is so tempting! Such excitement! Kelleyn, now *there’s* a new interpretation to the egg on the seder plate ! haha ! There was a conference on kosher chocolate (ChoKasher) at the show, and there were all sorts of fun chocolate lollipops and bars, so that’s what was on our dessert table. (That and chocolate covered matzoh, of course.) Hope you had a happy and delicious Easter ! Samantha, I loved those chickens, no clue why I didn’t get one myself ! 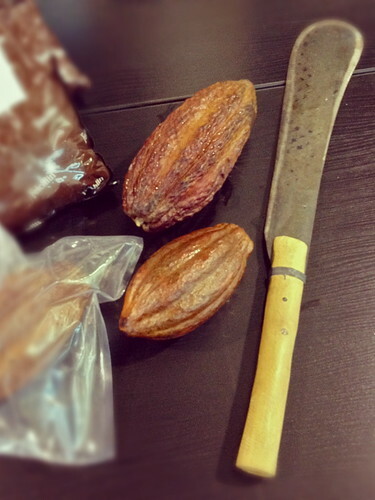 Love that Felchlin gave out samples of fresh cocao beans and pulp scooped right out of the pods. Absolutely amazing. 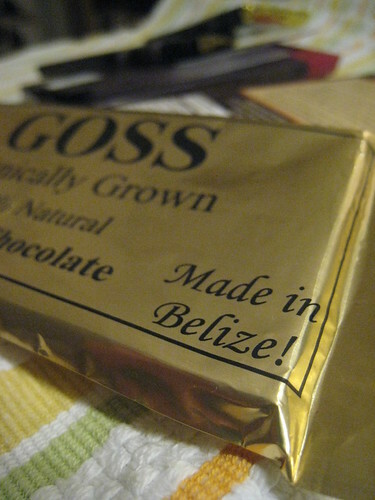 I bought some lovely chocolate on the Salon. Overall, I somehow expected more, but I think what puts a shade on my impression of the salon was that there where too many people for my liking (I was pushed away / jostled more than once) by people who pushed forward to grabbed samples to try. 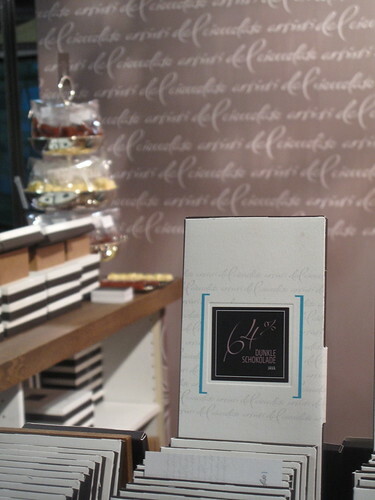 I saw many chocolatiers whose shops I love to visit, with enough time and room to actually look and get a good impression. I had a fabulous time. I only wish I could have seen more demos. Maybe I should have gone for a Carte Blanche. It was definitely a plus to go early on Friday and beat the crowds. 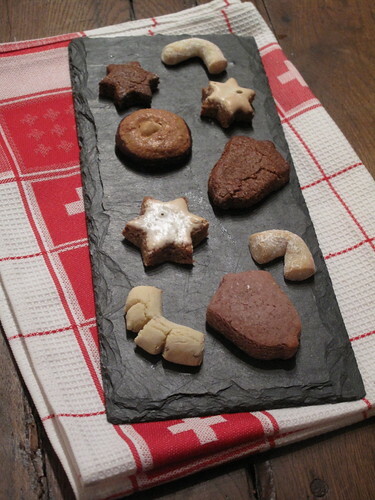 Would love to see even more artisanal chocolatiers next year. Amy, I am so glad Felchlin was a part of the Salon. Only, wish I could have actually attended their conferences myself ! 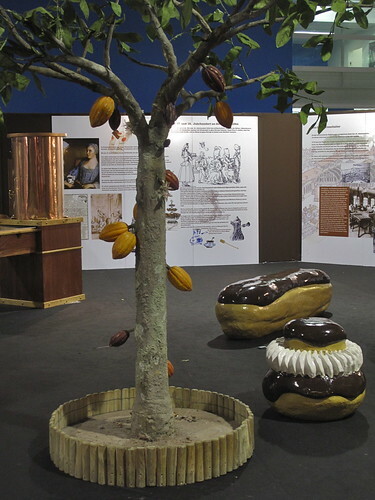 Very cool about exposing people to actual cocoa pods and all. So so glad you enjoyed. Kathy, so happy to hear, thank you for sharing ! Definitely smart to go on Friday, the quietest day of the weekend. 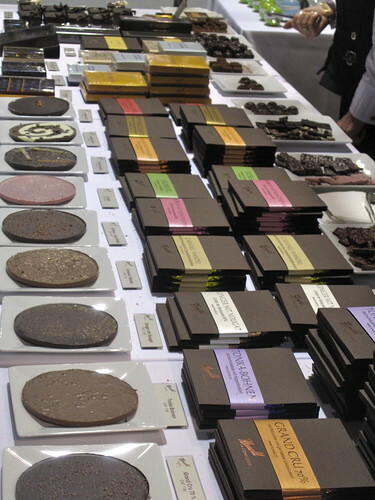 Hope to have even more exhibitors, especially smaller artisanal chocolatiers as you said, next year. That looks delicious! Was the show only in French or in German as well?